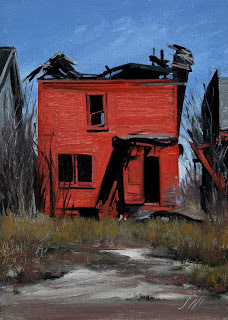 La Rouge Lunette, oil on linen panel, 5"x5"
Grand Street, Oil on linen canvas, 62"x48"
Michigan Central Detail, oil on linen panel, 7"x5"
I was fortunate to get inside the train station last weekend and was surprised at the amount of decay since the last visit. Being inside is a very strange feeling, completely silent except for the wind, similar to being out west away from everything . 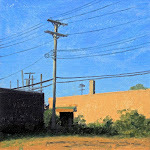 I will be doing more paintings in this series. 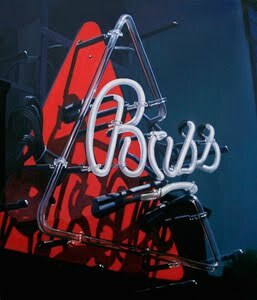 The Detroit Alphabet, "E", oil on linen panel, 7"x5"
This neon "E" is from the sign for Ellie Wines in Royal Oak, MI. 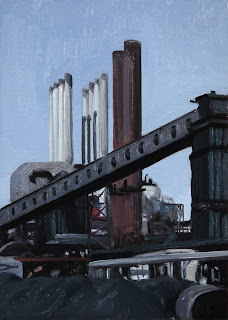 Ford Rouge Plant, oil on linen panel, 7"x5"
This painting is of the Ford River Rouge Plant before the smoke stacks were taken down and looks similar to when Charles Sheeler photographed and painted the Rouge plant. This is an iconic Detroit landscape. 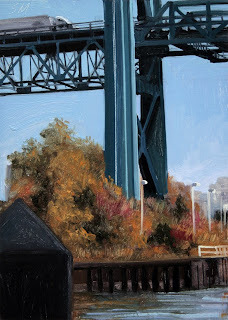 Ambassador Bridge, oil on linen panel, 7"x5"
Fall scene of Ambassador Bridge. I was commissioned to do a painting for the Canadian Consulate a few years ago and this is one of the reference photos I shot for that project. The budget was not included in the proposal so it was never completed. 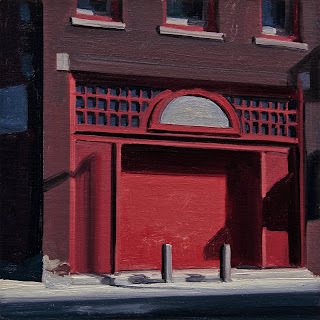 12240 Woodward Ave, oil on linen panel, 7"x5"
Interesting doorway details and graffiti on Woodward Ave.
Spring Shadows, oil on linen panel, 5"x7"
Spring has finally arrived in Detroit. Interesting contrast of the shadowed wall and white interior walls seen through the open windows. 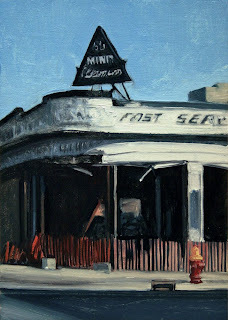 60 Minit Cleaners, oil on linen panel,7x5"
An abandoned burned out building on woodward Ave. This building burned down a long time ago, and is no longer standing. I really like the strong dark mass with the hi-key color accents. 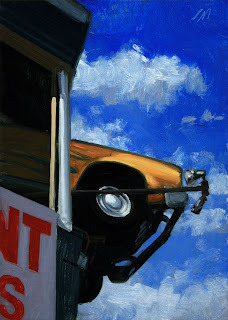 This is one of my favorite paintings that I have done for the daily painting blog. 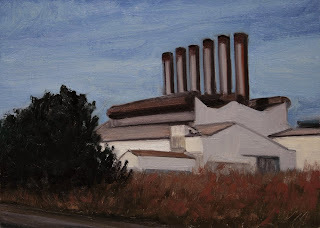 Highland Park Plant, oil on linen panel, 5x5"
Abandoned Ford Highland Park Plant. This is visible from Woodward Ave in Highland Park. 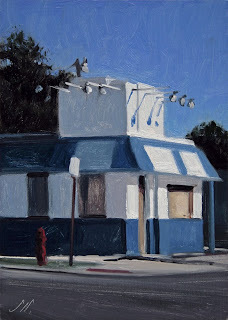 Forgive, oil on linen panel, 7x5"
Wetmore's, oil on linen panel, 7x5"
Wetmore's is on Woodward Ave a few blocks from our house. 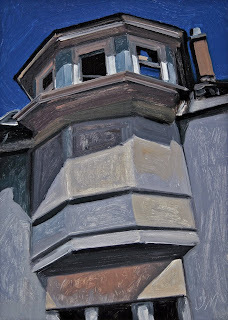 I have always wanted to paint it as it is such a landmark. Their ad says: "Stop where you see the car on the roof" The wheels spin and the headlights shine. The road is named after Judge Augustus Woodward, who redesigned the city after the 1805 fire. 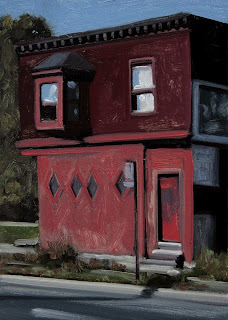 Angles, oil on linen panel, 7x5"
There are so many abandoned and boarded up houses in Detroit. 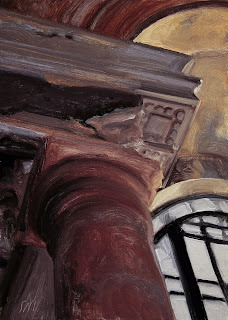 They do make interesting subjects for painting, really allowing you to move paint around to create existing textures. Michigan lost 21,900 jobs last month, most in the nation. so I am sure there will be more empty homes. 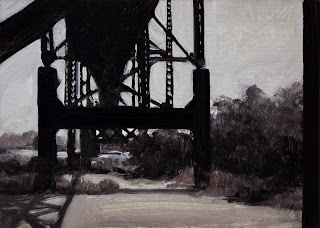 LaMaison Orange #2, oil on linen panel, 7x5"
Shades of Grey, oil on linen panel, 5x7"
Grisaille painting of the Ambassador Bridge. 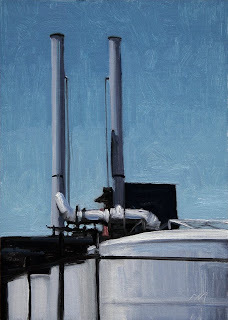 Twin Awnings, oil on linen panel, 7"x5"
I am not sure why certain things interest me visually. 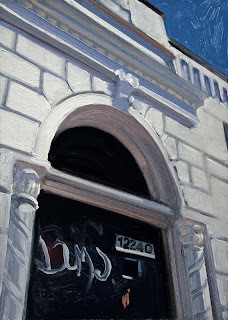 But I was very intrigued by the side of this house with the two awnings. 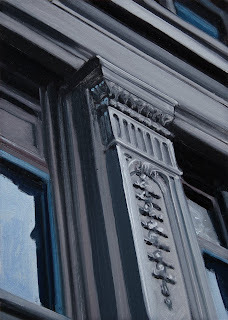 Corner Column, oil on linen panel, 7"x5"
Detail of a downtown Detroit building with ornate columns. 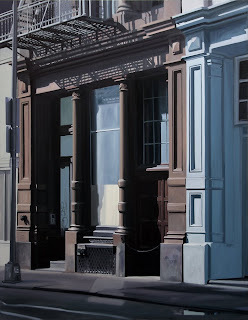 113-115 Prince Street, oil on linen, 42"x36"
Shades of Blue, oil on linen panel, 7"x5"
I love these long forgotten storefronts and/or small businesses spread all over the city. 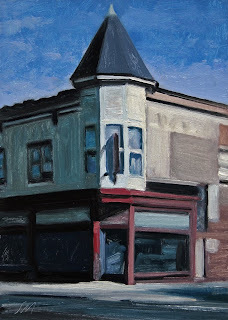 This one is in Hamtramck. 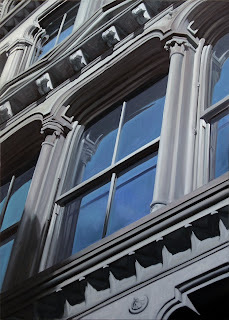 I liked all the cool blues playing against the warm brick columns. 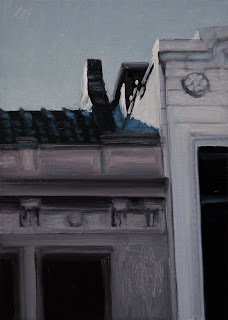 Midtown Bridge Shadows, oil on linen panel, 7"x5"
These images of the city with strong shadows and light seem to draw me in every time. 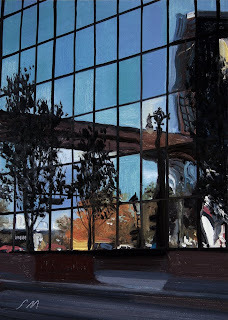 Morning Light, oil on linen panel, 7"x5"
This is a view of the GM Headquarters Building, formerly the Renaissance Building as seen from the warehouse district on a hazy morning. The center was built in 1977. 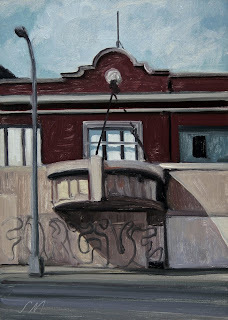 Corner Hardware, oil on linen panel, 7"x5"
Very interesting corner building in midtown Detroit. Victor Hardware is the name of the business. American Art Collector ad in the May Issue. 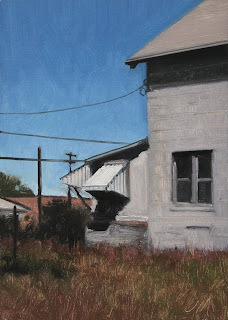 This is for my May show at the David Klein Gallery in Birmingham, MI. 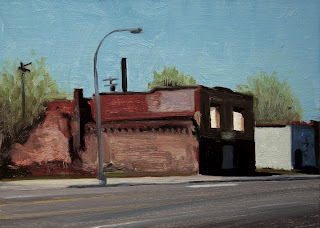 I will be showing Detroit and New York images. 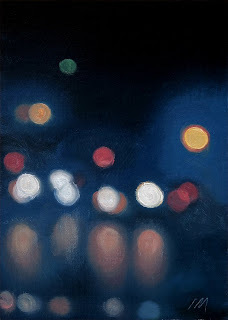 Paterea, oil on linen, 62"x48"
Citylights#30, oil on linen panel, 7"x5"
Number thirty in the Citylight series of paintings. 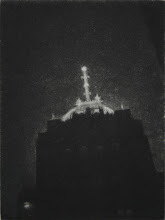 I started the Citylight series in 2001. 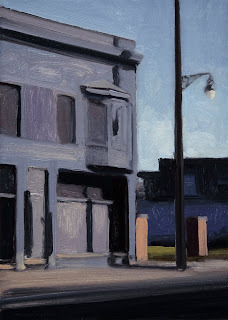 Hard times, oil on linen panel, 7"x5"
There are so many buildings like this in Detroit. They have so much character and charm. I can only attempt to capture the patina of their many lives. 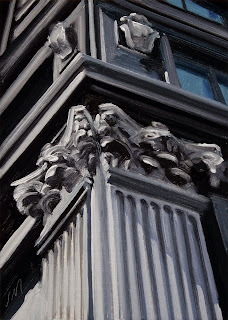 City Column, oil on linen panel, 7"x5"
Detail of a column on a dowtown Detroit building. 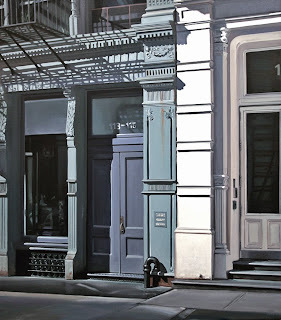 101 Spring St, oil on linen, 60"x42"
This is a painting of Donald Judd's Spring St loft studio. It is a wonderful cast iron building in SOHO, New York. 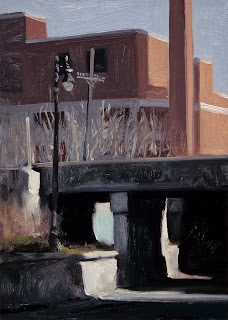 It will be in my upcoming May show at the David Klein Gallery. 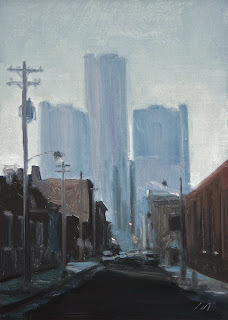 Landscape with reflections of downtown Detroit. 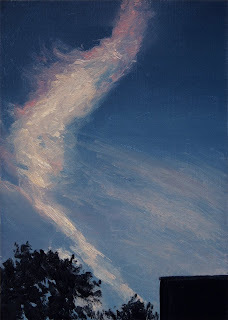 Twilight, oil on linen panel, 5"x7"
Landscape showing a rooftop and trees against an azure twilight sky with vapor trail clouds..
River Rouge Landscape#2, oil on linen panel, 5"x7"
Landscape showing afternoon sun on part of the vast River Rouge Industrial complex. 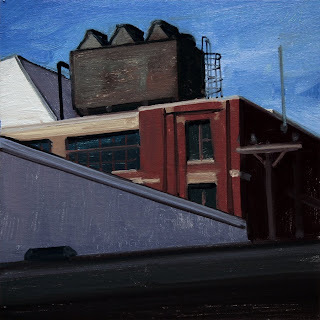 Rooftop Shadows, oil on linen panel, 7"x5"
Duex Stacks, oil on linen panel, 5"x7"
Detroit industrial landscape with storage tanks and stacks. 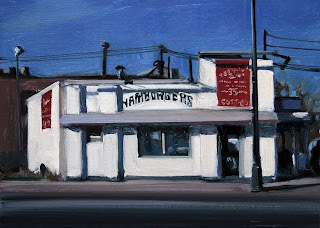 Hamburgers, oil on linen panel, 5"x7"
The Telway 6820 Michigan Ave. Their sign says: "Best hamburgers in town"